The Odyssey is Honda’s entry in the minivan market, and one that is continually ranked near the top thanks to its style, its powertrain, and the way it rides and drives. The latest generation was introduced for the 2011 model year, and the recent 2014 refresh gave the van a facelift and an optional built-in HondaVAC vacuum cleaner. Seating capacity is either 7 or 8, and cargo volume is 38.4 cubic feet behind the third row of seats, 93.1 cubic feet behind the second row, and 148.5 cubic feet behind the first row. To help keep weight down aluminum is used for the hood and front fenders. The Odyssey is rated Good in crash tests by the Insurance Institute for Highway Safety. What's the difference between trims? All versions of the Honda Odyssey are powered by a 3.5 liter V6 with i-VTEC that produces 248 horsepower and 250 lb-ft of torque. The 24 valve SOHC engine uses an aluminum alloy block and cylinder heads and features a redline of 6,300 RPM. Power is sent to the front wheels through a 6-speed automatic transmission. Thanks to the Variable Cylinder Management (VCM), fuel economy is rated at 19 mpg city and 28 highway, for a combined rating of 22. 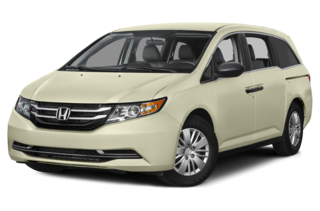 Why buy the 2015 Honda Odyssey? To keep the interior organized, the Odyssey is filled with nifty storage compartments, beverage holders, bag hooks, garment hooks, and a coin holder. A Honda DVD Rear Entertainment System is available to keep children (or even adult passengers, who won’t have a problem fitting in the rear) entertained. If you happen to have a family full of small children, the Odyssey features up to five LATCH anchors. Active Noise Cancellation (ANC) helps to reduce interior noise and the Active Control Engine Mount System (ACM) helps reduce vibrations. Some trims include second and third row sunshades. Standard safety features include Electronic Brake Distribution (EBD), Brake Assist, and a rearview camera, while Forward Collision Warning (FCW) and Lane Departure Warning (LPD) are standard on higher trim levels. Towing capacity is 3,500 lbs.